If you love to cook then you would love a cooking lover’s dream kitchen created by Bannochie Builders, Inc. We provide Eden Prairie, MN homeowners with the opportunity to design the kitchen of their dreams. Our team is dedicated to creating innovative ways to add more function, storage and character to existing kitchens. As Experienced and Licensed Remodeling Contractors we have the ability to open up walls or build a room addition for a more functional layout. Smart Storage Solutions and a Functional Kitchen Work Triangle provide a wonderful atmosphere for creating culinary masterpieces. The layout of a room is crucial for creating a More Functional Layout that works for you. Bannochie Builders, Inc. can meet with you to discuss how you would like the space to function. Our experienced team can provide innovative ideas for designing a Functional Floor Plan. Opening up the kitchen to an adjoining room can make a cramped kitchen feel very spacious and welcoming. We can assist you in redesigning the placement of Cabinets, Appliances, Storage, Islands, Countertops and Sinks to create a Functional Work Triangle. Any cook knows that Storage for all of your small appliances, cookware, dishes and spices makes your life easier. Smart Storage Solutions create a space for all of your kitchen essentials to be close at hand, yet out of the way. The experienced kitchen design experts at Bannochie Builders, Inc. have kitchen organization and storage ideas to work in small or large kitchen spaces. Bannochie Builders, Inc. is a trusted Kitchen Remodeling Company. 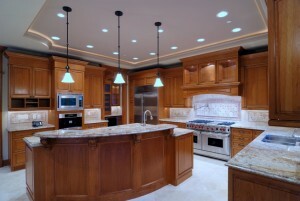 We are Experienced and Licensed Remodeling Contractors that provide kitchen renovations in Eden Prairie, MN. Contact us for a more functional kitchen layout that incorporates the Kitchen Work Triangle and Smart Storage Solutions. Our team can help you to create a Cooking Lover’s Dream Kitchen that works with your budget. This entry was posted	on Wednesday, May 20th, 2015 at 4:57 pm	and is filed under Home Remodeling, Kitchen Remodeling. You can follow any responses to this entry through the RSS 2.0 feed. You can leave a response, or trackback from your own site.